After looking at MICHALSKY I decided I wanted more flower print in my wardrobe. It is an instant mood lifter and can brighten any outfit. I have compiled my flower power want list. It may only have two items on my floral list at the moment but it’s sure to grow, ha just like a flower itself. 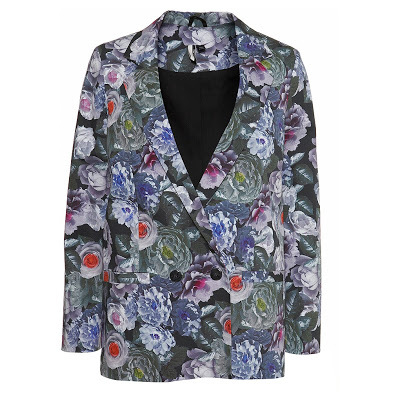 Numero uno is this Floral Topshop Blazer. I’ve wanted a blazer jacket for ages but couldn’t find one I really liked or that fitted properly but I can imagine this one on with rolled up sleeves over a grey mini that I have. The colour palette is subdued and will hopefully brighten my pale complexion. I have seen Queen Michelle in hers and do not want people to think I am copying her by wanting and possibly buying one. It would of course be worn in different ways as I am no where near as stylish as the Queen. This is my number two, Traffic People’s Silk Floral Jumpsuit for £65. This makes me dream of long hot summer days, drinking cider in the park with friends, plaiting flowers into my hair…do I need anymore reasons to buy it? Oh, just thought I have some fab KG platform wedges that would absolutely complete this outfit.